Sheep-laurel grows in the woods near the shores of streams and ponds. Each delicate blossom has ten triggers—the bent-back stamens—set to spring and dust a visiting insect with pollen. A smaller relative of mountain laurel grows wild and blooms beautifully in mid-June in the woods near Westborough's ponds and streams. With odd names such as sheep-laurel and lambkill, this small shrub (Kalmia angustifolia) comes into full bloom around the same time that mountain laurel (Kalmia latifolia) festoons our gardens and landscaped areas. 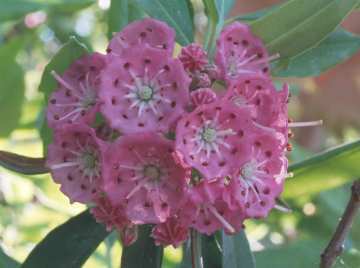 Sheep-laurel's clusters of cup-like flowers are a much deeper pink than those of mountain laurel and are often partly hidden by leaves. Both laurels are evergreen, lovely, and toxic, although sheep-laurel gets more credit for its toxicity. This low-growing shrub was often found in pastures, which were more common in the New England landscape of 1830-1880 than today. Sheep and other grazing animals were tempted to eat the leathery leaves in winter or early spring, when little else is green. The animals would become paralyzed and die. Wild animals such as deer and rabbits may be less affected. Neither sheep-laurel nor mountain laurel is a true "laurel" of the type used for crowning winners of athletic contests with wreaths in ancient Greece. Sheep-laurel tends to grow in places that are either quite moist or quite dry. Keep an eye out for it near the shores of streams and ponds such as Sandra Pond, Lake Chauncy, or Mill Pond. It is also called dwarf laurel, a reminder that the shrubs are often only waist-high. Like mountain laurel, the delicate flowers of sheep-laurel have a special beauty and symmetry. They also contain 10 little triggers, set to spring and dust insect visitors with pollen. Each intricate flower has 10 stamens that are bent back, with their pollen-bearing anthers tucked into pockets in the flower petals. When an insect prods the center of a flower, some of the stamens pop upright, sprinkling pollen on the insect, which will carry it to another flower. Like so many other plants that have developed poisons that help to ward off animals and insects that would eat them, sheep-laurel has had its medicinal uses. Native Americans treated bowel problems with minute amounts of tea made from its leaves, flowers, or twigs. A tea has also been used externally for sprains and other forms of swelling and pain.